One non-Irish national man was arrested in the seizure. 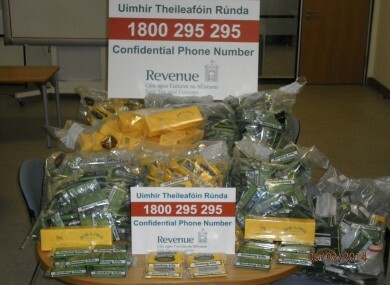 A NON-IRISH NATIONAL in his 30s was arrested after a seizure by Revenue last night. The intelligence- led operation, code named ‘Cigar’, saw officers from Revenue’s Customs Service seize 85kgs of tobacco and 3,800 cigarettes with a total estimated retail value of €35,720 and a potential loss to the Exchequer of €28,576 in Cork. Officers originally discovered a quantity of tobacco and cigarettes when they stopped and searched, and subsequently seized, a 4×4 vehicle in the Mallow Road area of Cork city. In a follow up search at a private residence in county Cork, officers executed a search warrant and uncovered large amounts of unstamped Golden Virginia, Amber Leaf and Original Virginia tobacco and Jing Lin cigarettes in the house when tobacco dog Harvey reacted to an area behind a locked door. Email “'Operation Cigar' leads to seizure of 85 kilos of tobacco and nearly 4,000 cigarettes”. Feedback on “'Operation Cigar' leads to seizure of 85 kilos of tobacco and nearly 4,000 cigarettes”.